Imagine how tasty this buffalo chicken pizza will be when you know the chicken wasn’t fed a continuous low dose of tetracycline. We’ve never really understood the appeal of chicken on pizza, but hey — some people really like it. So this should be good news for them, as Papa John’s has announced plans to only source chickens raised on vegetarian diets and without antibiotics. Papa John’s uses chicken both as a chicken topping and in “chicken poppers,” but the company said today that by summer 2016 these would both come from drug-free chickens. One thing the announcement didn’t mention: Papa John’s chicken wings. Given that you need multiple birds just to make a single 8-piece order of hot wings — whereas you can probably get a couple pizzas’ worth of grilled chicken breast toppings from a single full-grown chicken — it might not yet be feasible for a company the size of Papa John’s to make that switch. 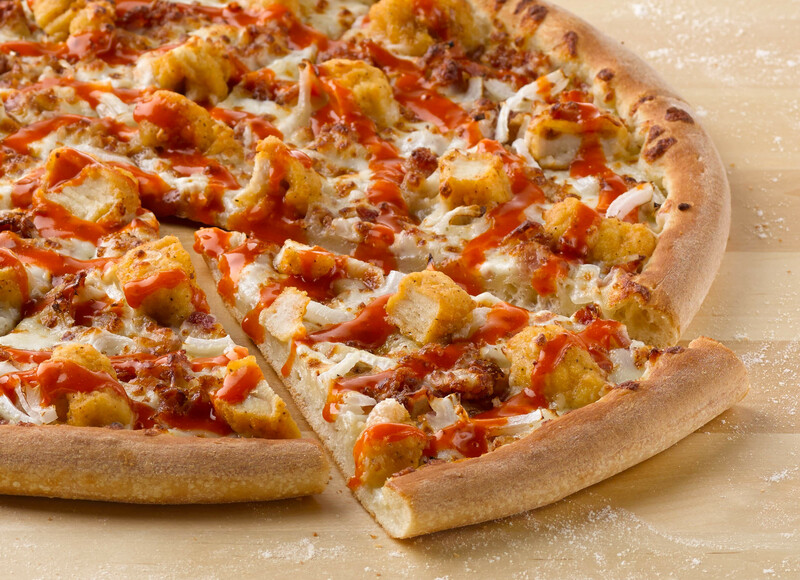 And of course, chicken represents just one of many meat toppings used on Papa John’s pizza. The company has not yet indicated any plans to change how it sources the beef and pork it uses for sausage, pepperoni, and other toppings. But this is at least an improvement for the pizza chain, which recently earned an “F” on the Natural Resources Defense Council’s antibiotics report card for having no apparent policy with regard to antibiotics. Unfortunately, PJ’s was not alone in receiving that failing grade. In fact, Pizza Hut, Domino’s, and Little Caesars were also slapped with an “F” in that report card, giving big Papa the distinction of being the first of the pizza mega-chains to do anything about curbing the overuse of antibiotics in farm animals. However, a number of big fast food names have at least begun the process of reducing the amount of drugged-up meat they buy. Chipotle and Panera already avoided meat from animals raised on antibiotics. Then Chick fil-A got the ball rolling in early 2015 by declaring its intention to eventually phase out the use of drugs in its birds. In March, McDonald’s announced its plans to source chickens raised without using antibiotics that are medically important to humans. More recently, Wendy’s began testing antibiotic-free chicken in a handful of cities. Finally, Subway announced in October that it plans to have its entire menu antibiotic-free… over the next ten years.